The DIY Bride: Bride's Bracelet - Check! 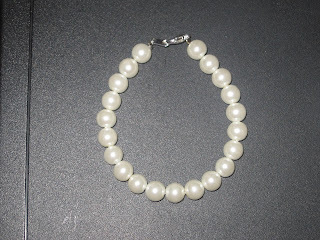 I had some left over glass pearls after making the pearl necklaces for my bridesmaids, and I wasn't looking to spend a lot of money on something that I would only wear for one day, especially since I never wear bracelets. I'm not wearing a necklace for the wedding and I bought my beautiful earrings a while back, but I thought about wearing possibly a bracelet to compliment them. But anyways, enough jibber jabber.. here is my final product! It is just really simple, and I matched it with my real pearl earrings and you can't even tell a difference. I'm excited to wear it!